Continuing our trip, we drove up and camped in Richardson Grove State Park for the night. 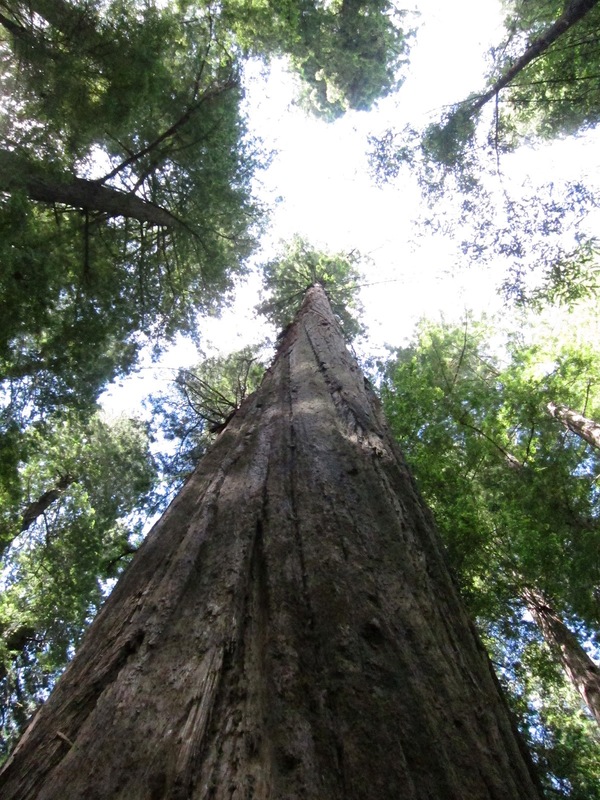 Northern California is home to the tallest living things in the world, the giant redwoods. 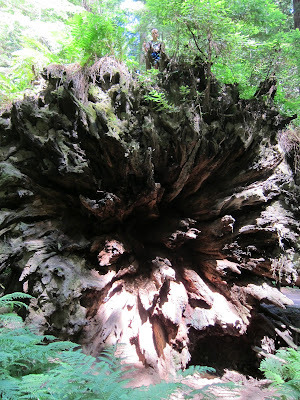 I love the redwoods, they are so massive, that it gives you an otherworldly feeling as you journey through them. I used the Statue of Liberty in the picture because it seems like everyone uses the Statue of Liberty when describing tall things here in the US. 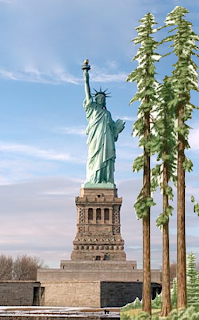 I personally have never been to the Statue of Liberty, but I suppose if I did, it would put it in perspective. If I ever go see it, I'll probably be thinking, "Gee, this statue is almost as tall as a giant redwood." In the redwoods, we also met up with members of my Boy Scout Troop who would be joining us for river rafting. And as Scouts, we're always on the lookout for a good swimming hole. There's a nice one at Richardson Grove State Park and when we were driving, we found another that the locals told us about at the California Federation of Women's Clubs Grove, just south of the Founder's Grove in the Avenue of the Giants. And to my surprise, there was an added bonus – a beautiful four sided outdoor fireplace picnic area designed by Julia Morgan. Those Redwoods are truly amazing. Seems our family drove thru one when I was a kid....or was that a Sequoia. We drove through the Redwoods a few years ago - amazing trees! And then there was the one you could actually put the car inside... and the giant Paul Bunyan, did you get that far?? Jules, the Paul Bunyan is up at Trees of Mystery, another great stop (which I visited in high school), but we didn't have time on this trip. good the creators web page, or two from a pre-setup database. kodi tv addons definitely downloaded and installed personally. nice. good a keyboard to modify and separate out pictures on the Personal computer. Drake Snapchat to be interchanging daily standard 800 Million dollars nice. good This is usually how you can sign in into WhatsApp online WhatsApp Sign In You can produce tone telephone calls to your close friends. nice. good If you want to obtain any kind of documents choose "Receive";. https://shareitforpcdl.com/ A feature called Bluetooth is primarily existed in nice. good Play Store for apple iphone that can be tough. There are playstore viruses or malware attached to it PlayStore Continuously nice.